(January 30, Paris, Sri Lanka Guardian) In the clear, cold, grey blue light of this winter’s morning in Paris, one remembers that Camus’ L’Etranger, in the original French Gallimard edition, was among my mother’s bedside reading. Lakshmi Sylvia de Silva, nee Fernando, died ten years ago at the age of 73, and I owe her an apology. Not for dropping out of my Fulbright scholarship and doctoral studies in upstate New York after the first class honours degree and CL Wickremesinghe prize for best results from Peradeniya university, which she felt had vindicated all her struggles and sacrifices as "almost a single parent" (as she saw herself). Not for my two risky years underground, and one in clandestine, Spartan self-exile across the water, during which she skinned her knees in prayer in church every single day. Not for the visit she made to the intensive care unit at Nawaloka hospital in ’92 to see her son after having been beaten up and stoned by a mob at Kanatte. Not for the failed marriages and ex-daughters in law. Not for being an only child "doing his own thing" as he had already announced in his teens and unthinkingly placing his mother on a permanent emotional roller coaster of anxiety. Not for having missed being at his mother’s bedside when she died, having watched, in a solitary moment, through the glass doors of the emergency theatre at Asha Central just 18 months before, as his father Mervyn was "suddenly shocked by my [his] own mortality". The apology I owe my mother is a political, ideological and even a theoretical one. Growing up I had regarded her as a reactionary, a conservative, perhaps the most reactionary, rightwing and conservative person I knew or could think of. In one of my first attempts at theorising I had coined the term ‘matriarchal despotism’. Entering my teens and misapplying what I was avidly reading, I once denounced her as a "neo-fascist". That was on one of the few occasions that she had rumbled my father’s and my plans to infiltrate me in their company for the ‘late show’ (9: 30pm) of a good movie with an ‘adults only’ tag from the local Censor board (an entity which the Daily News under Mervyn’s editorship crusaded against). Since I was just past the age of peremptory corporal punishment (an age limit I had decided upon and announced) she complained to my father, demanding to know whether he was going to let me get away with the rude appellation. He raised his eyes from his article in the pink pages of the "FT" (London) he was reading on the couch with his chilled Lowenbrau on the nearby coffee table and glancing at me with a raised eyebrow, deadpanned "but why call a spade a neo-spade?" Later that evening he would take a more successful shot at managing my reaction to maternal ‘tough love’: "since you understand the historically progressive role of the ruthless Stalinist consolidation, with all its excesses, of the foundations of socialism." He was unable though, to resist a throwaway line, which was still closer the truth: "if we had more than one child, the Ten Commandments could have been divided up; but now, you’re expected to observe all ten". This is how, at long last, I had begun to understand her when I wrote The Old Man and the Typewriter serialisedin three parts in the Sunday Times in Feb ’99, months before Mervyn died: "Herself a rebel, converting to Christianity against the violent opposition of a beloved father (a minor public official, brilliant Buddhist polemicist and fanatical proselytiser from Panadura) Lakshmi Sylvia taught memorably and lodged at St Bridget’s Convent, drove a car, played competitive tennis, swam, boated, danced, was one of the first to cut her hair short, read Camus, gifted Mervyn books by Edmund Wilson, had Pieter Keuneman’s poster on her wall and was a subscriber to the Left Book Club. But as it became more and more evident that Mervyn’s waywardness was structural, she left her left-ish liberalism somewhere between HD Sugathapala’s drawing room and the Navamaga editorial collective, turning into the perfect psychological and behavioural synthesis of where she was coming from and where she had gone - Panadura Buddhism and convent Catholicism - an exact antipode of her husband. Perhaps a necessary and functional transformation indispensable to his salvation." (Sunday Times, Feb ’99). 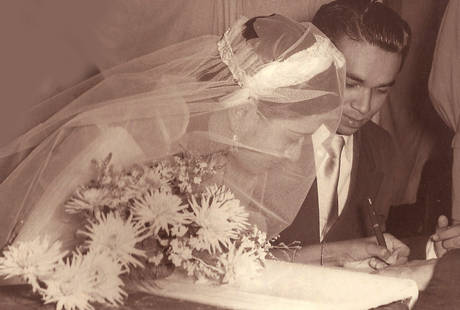 I rediscovered the album of wedding photographs of Mervyn de Silva and Lakshmi Fernando, with a press notice stuck on it, from August 20th 1955. Had they lived they’d have been 55 years married. The photographs show that though my father’s brother Kingsley (‘AVKV’) was a ‘best man’, no parents were present from either side: mine had broken religious and caste barriers and ‘dowry’ was never in their dictionary. My paternal grandfather was unhappy about his ‘Goigama’ Buddhist son marrying a Karawe Catholic girl who was his senior by two or three years while my maternal grandfather was upset that his Buddhist son-in-law to be had not stood up to his oldest child, a defector to the Catholic faith and teacher at the country’s leading convent, unhesitatingly marrying her in a Colombo church (All Saints, Borella), following a token spot of ‘religious instruction’ from a European padre. The album shows a bride with short hair under her veil and happiness in her eyes, wearing a graceful, soft sheer outfit which could have been a sari, being gently walked, and kissed, by a slim man with easy self assurance, Brylcreemed hair, a double breasted suit and sleek unprinted satin tie. They were in their twenties. There was no standard studio portrait. They weren’t like that. I made some cardinal conceptual errors, conflating authoritarianism with fascism, rightwing liberalism with rightwing reaction, conservatism with traditionalism. I had taken for granted my mother’s modernity and the independence that was a sign of that modern mind. I had not appreciated the magnitude of her rupture with tradition and archaic values, the courage it took to combine love of father with rejection of patriarchy. I had not understood just how progressive and radical she was not only in her own time but perhaps even more so, against the backdrop of ours. It took two experiences for me to understand and appreciate her more fully. One was looking around and seeing that things my mother had done already by 1949; attitudes she had displayed, were difficult for most Sri Lankan women, including young ones to bring themselves to do fifty years later. What she was, her way of being, as a modern, independent minded, non-traditional, aware, well-read, assertive woman, who never had to struggle to be regarded as an equal by any man including her famous husband, was way beyond what many Sri Lankan women would culturally dare, including middle class urbanised ones, even in the 21st century. The reason that the practice of women dressing in deference to the wishes of fathers, husbands or seniors came as such a culture shock to me was that it was unthinkable (from all recounted testimony, not to mention my acquaintance) that at least from adulthood, my mother would have dressed, worn her hair or makeup, other than as she pleased. Though my father and I would help her pick everything from accessories to sari, I cannot think of anyone, Mervyn included, who would have dared suggest hair style, or manner or mode of attire or appearance. Her advice to numerous nieces on the contentious issue of mini-skirts was "what on earth, if you can carry it off, wear it!" Formidable personalities though her father and husband were, there was never a question, leave alone a hint of gender or role based deference on Lakshmi’s part. I never saw or heard of her making a traditional gesture of obsequy to an elder. There was never a question in my mind or in the perception of their families and friends that Mervyn’s and Lakshmi’s was a marriage and partnership of equals. As woman, wife and mother, hers was neither the second place nor one of spurious reverence. Never was I urged to be deferential to my father over my mother. All her decisions were sovereign ones: her ‘spiritual advisor’ of over half a century, Fr Perniola, PhD, author of the Oxford Pali grammar, historian of the Catholic Church in Ceylon and one time head of Sri Lanka’s Jesuit chapter told me that when she quit her vocation of teaching at St Bridget’s, she mentioned it to him only later. The second experience that enabled me to understand my mother was an epiphany of sorts: Singapore. Here I found the maternal model writ large: disciplinarian, managed, modern, urban, multicultural, and meritocratic; an authoritarian modernity. This was or has become the East Asian model, practised by the ‘Tiger economies’ before Deng Hsiao Peng synthesised it with China’s revolutionary heritage. I immediately understood my parents in global terms. If Thaththa was more of a Galbraithian liberal, Malrauxvian Gaullist or simply a Western European social democrat, Amma was more East Asian modernist. Mervyn never questioned the description of him, however nastily intended, as "Westernised", while Lakshmi was proud to speak of "we Asians" (never "we Sinhalese", though). In Asian terms Mervyn was more Nehru-Chou En Lai and the ‘Bandung moment’ (he ridiculed Sir John); Lakshmi more Lee Kuan Yew and ASEAN. Mervyn’s left-liberalism, which I had taken to the next level of a radical leftism, had obscured in my eyes, the progressivism of Lakshmi’s modernity. I reacted understandably against the authoritarian ‘management style’, but perhaps failed to appreciate sufficiently the achievement, embodiment and dangerous sustenance of the modern. We had travelled through Europe during the ‘events’ of May ’68, talking and listening to student audiences. My parents witnessed the anti-Vietnam ‘Days of Rage’ in the USA and the March on the Washington monument, and I never heard a word of criticism from my mother of the rebellious youth, their conduct, clothes, music or distinctive culture. I watched Jon Voight and Dustin Hoffman in ‘Midnight Cowboy’ at the Savoy cinema and ‘Jesus Christ Superstar’ in Leicester square, in my mother’s company, not my father’s, and she would take me (still in the school’s blue short pants) to Lewis Brown’s in Colombo for my first Hendrix and Stones albums.